3 Bedrooms, 1 1/2 Bathrooms, Ocean & Mountain Views. Sun Deck. 3 bedrooms, 1 queen, 2 de-lux singles with fitted carpets and closets. Plus1 small bedroom available for child, on request. Living room with view of Bird Islands comfortable seating for 5. Dining area seats 5, Kitchen equipped with fridge, stove, microwave. 3 bar stools, all utensils, crockery etc. Bath with shower wash hand basin, toilet. Full bathroom with, toilet, wash-hand basin, combination tub/shower. vanity mirror, wall cabinet. shaving point Half bathroom with toilet, wash-hand basin, shaving point. View and bush trails (200 acres) to mountain ridge to rear of property. Deer, moose and bear sightings on property. Two 3 seater sofa's, chair, rocker, coffee table, 3 small side tables, carpet square, carpet runner.glass fronted displal cabinet, small bookcase. shelving. Radio, TV. Electric, 4 rings and oven. Pine table with 6 chairs. 3 bar stools at kitchen counter. This house has everything--beautiful views, close to beaches and hikes, walking distance to a yummy bakery, and attentive and friendly owners. Extensive hiking, bush walking, bird watching and beachcombing, on property. 3 min. walk to bakery/ deli/ restaurant with wi-fi. 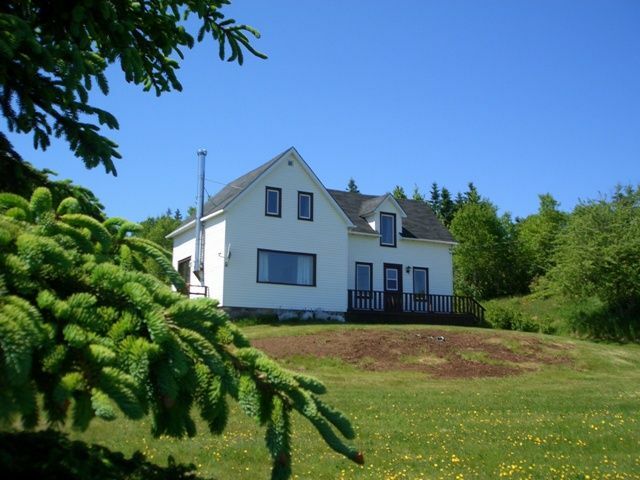 Ideal base for Cabot Trail events including Ceilidhs,Celtic Colour Festival, (October), Bell Museum, Baddeck, Fortress of Louisburg, Highlands National Park, Sandy beaches, Golf courses.